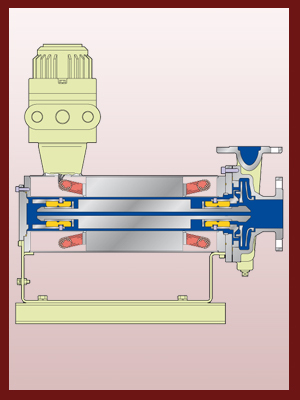 The pump and motor are connected by an adapter plate or a FB housing. A portion of the liquid being handled is taken from the impeller outlet part of the pump chamber into the rotor chamber for the purposes of cooling the motor and lubricating the bearings and returned to the pump chamber through the hollow shaft. A jacket may be fitted to the outer wall of the stator assembly depending on the temperature and other characteristics of the liquid being pumped.